Thanks to my old college buddy Declan who sent me a link to this picture of Robert Tony Stark Downey Jnr. 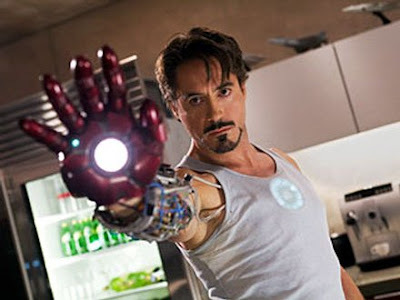 with a first look at Iron Man's armoured gauntlet. Looks pretty go, I like the hint of the unibeam projector under his vest.